This Living Theatre of Plants and People is a vibrant reminder of our place in nature and is a living demonstration of regeneration. In a couple of short years the team transformed an exhausted clay pit into a stunning lost world reminding us of what we 'ordinary' people can do once we set our minds to it. In the Rainforest Biome you can experience the sights, smells and sheer scale of the rainforest in the world's largest greenhouse. Discover the tropical plants found in the products you use every day and understand the ways in which they are being managed for a positive future. In the Mediterranean Biome you can travel to South Africa and California and walk amongst orange and lemon trees, old olive groves and gnarled vines. Investigate the cork popping present and glimpse a future of naturally coloured cottons and new tastes and ideas. In the Roofless Biome - 30 acres outdoors - the crescent shaped terraces tell the story of plants that have changed the world and which could change your future. Hemp and sunflowers are growing here under the warm Cornish sun. Tea too. 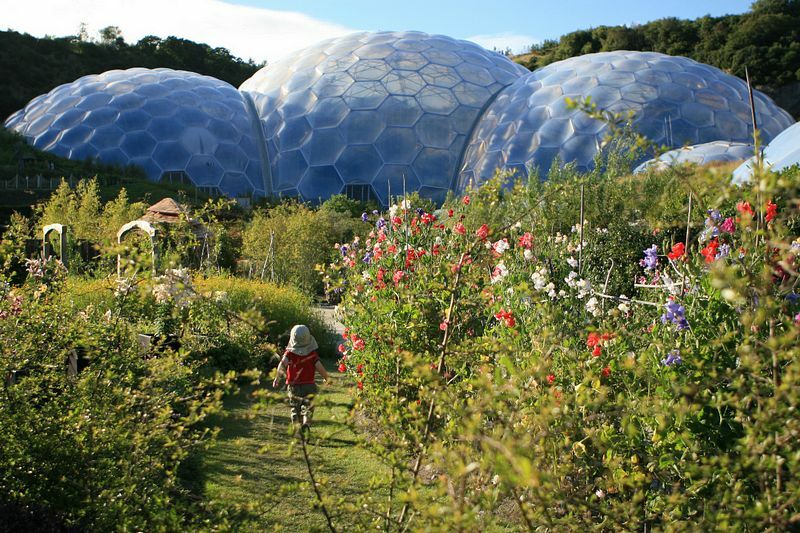 Eden is a place with serious ambitions - a symbol of the strength of people working with nature to repair damaged places and to make our environment rich and healthy. Virtually the whole site accessible by wheelchair, wheelchairs for hire. Communications system for people with learning difficulties, Braille, large print and audio for the visually impaired. Rain can be a problem, we're fine when the weather isn't, we're great when its great but we are no Eden in torrential rain, remember that most of the global garden is not under cover. Take A390 or A30 or A391 from St Austell and follow the brown signs.